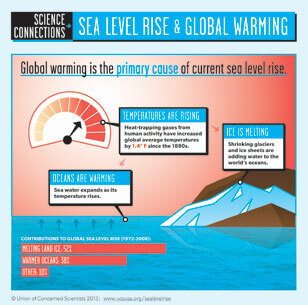 Global average sea level rose roughly eight inches from 1880 - 2009. The average annual rate of global sea level rise accelerated from 1993 - 2008, increasing 65 - 90 percent above the twentieth century average. 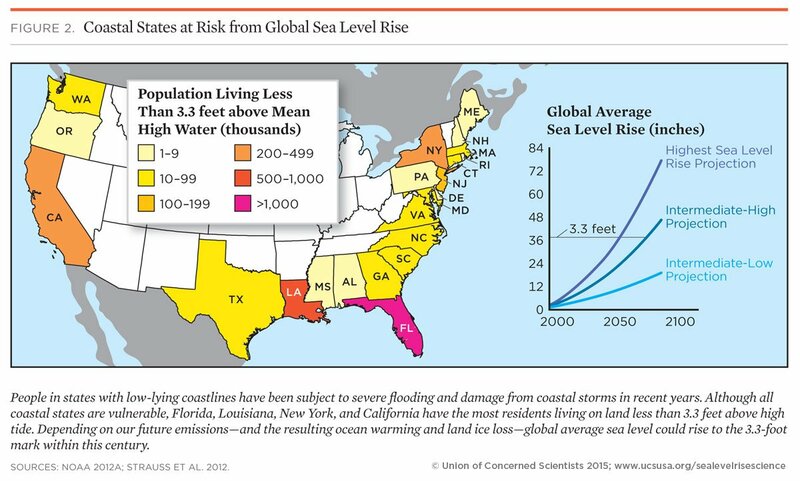 The US East Coast and Gulf of Mexico experienced some of the world's fastest rates of sea level rise in the twentieth century due to local and regional factors. Human activities, such as burning coal and oil and cutting down tropical forests, have increased atmospheric concentrations of heat-trapping gases and caused the planet to warm by 1.4 degrees Fahrenheit since 1880. Land ice—glaciers, ice caps, and ice sheets—is shrinking at a faster rate in response to rising temperatures, adding water to the world's oceans. 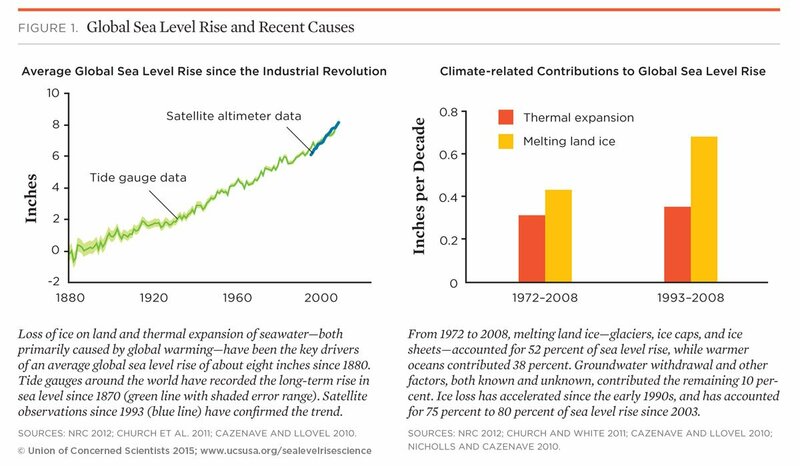 As the rate of ice loss has accelerated, its contribution to global sea level rise has increased from a little more than half of the total increase from 1993 - 2008 to 75 - 80 percent of the total increase between 2003 - 2007. Our past heat-trapping emissions have committed us to continued sea level rise over the coming decades, but our present and future emissions choices can affect the rise in seas and the pace at which it unfolds beyond 2050. Even if global warming emissions were to drop to zero by 2016, scientists project another 1.2 to 2.6 feet of global sea level rise by 2100 as oceans and land ice adjust to the changes we have already made to the atmosphere. Projections for global sea level rise by 2100 range from 8 inches to 6.6 feet above 1992 levels, though the lowest end of this range is a simple extension of historic sea level rise—and recent data indicate this rate has nearly doubled in recent years. The rate and magnitude of the loss of ice sheets, primarily in Greenland and West Antarctica, will have the greatest effect on long-term sea level rise. Shoreline erosion and degradation. Rising sea levels allow waves to penetrate further inland, even during calm conditions, increasing the potential for erosion. Amplified storm surges. Coastal storms often cause storm surges, which occur when high winds push water inland. 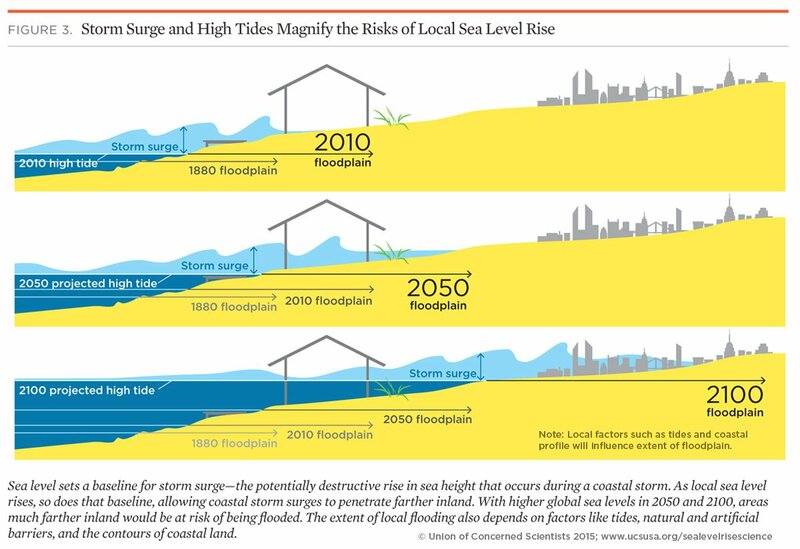 With rising seas, storm surges occur on top of an elevated water level and reach farther inland, with potentially catastrophic damage to homes and infrastructure. Permanent inundation. Many low-lying coastal land areas are expected to be gradually submerged by rising sea levels. A rise of two feet above today's sea level would put more than $1 trillion of property and structures in the US at risk of inundation, with roughly half of that value concentrated in in Florida. Saltwater intrusion. Saltwater can reach further into coastal groundwater sources as sea level rises, increasing the salinity of freshwater used for drinking and agriculture. Communities must weigh the costs and risks of accommodating the rising seas, retreating from them, or trying to defend coastal properties and infrastructure with protective measures. 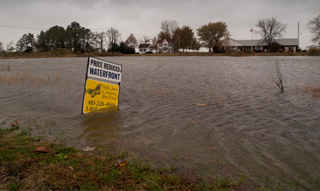 Traditional defensive approaches--such as building seawalls and levees, or replenishing sand along eroded beaches--can help protect against flooding and damage but may not provide adequate or sustainable long-term protection. Maintaining or restoring natural buffers, such as barrier islands, tidal wetlands, and mangroves, can also help defend coastlines. Measures like elevating and flood-proofing structures can help accommodate temporary flooding and gradual inundation. The most vulnerable coastal communities may increasingly need to consider the stark option of some form of retreat from the rising seas. To limit the long-term risks of sea level rise and the costs of adapting to it, we must work toward deep reductions in the global warming emissions that are the primary cause of rising sea levels.